Long range bombing missions could last anywhere from 6 to 8 hours per sortie and in the beginning of the war pilots and flight crewman would usually bring along their own snacks to eat during those long flights. It was determined by the Army Air Force and the Quartermaster Corp that there was a need for special rations to be supplied to air crews. A series of special-ration specifications in 1943 and 1944 covering "Air Crew Lunch" and "Air Crew Lunch Combat" was adopted. 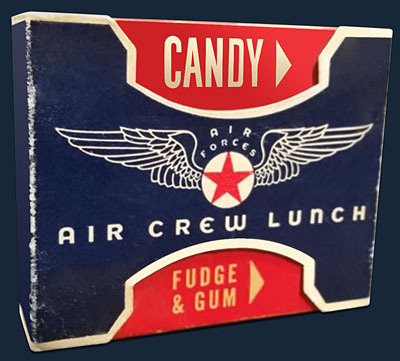 "Air Crew Lunch" made it's debut in September 1944. This wasn't really a lunch but more or less a confection based supplemental type pocket lunch. The packaging was a small unique matchbox style container designed to be carried in a flight suit or uniform pocket and capable of dispensing it's contents while wearing heavy flight gloves. The "Air Crew Lunches" were shipped and distributed in five gallon cans containing eighty boxes each. 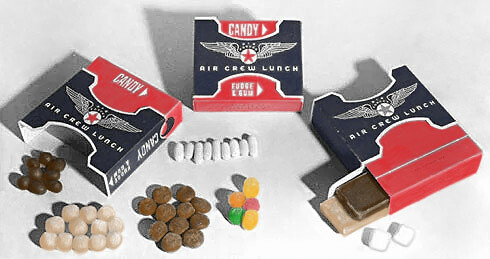 The "Air Crew Lunch" candy compartment contained a loose selection of chocolate drops, pancoated cream centers, fondant creams, gum drops, jelly and licorice drops, and pancoated peanuts. The fudge and gum compartment contained a vanilla and a fudge bar and gum. Easy one-hand manipulation of the red-and-blue package permitted the items to drop out of the selected compartment.